Palmer Luckey is a young guy from California, smart as a whip, and obsessed with virtual reality. After amassing a serious collection of the day’s top virtual reality tech, he realized nothing came close to the Matrix-like experience he wanted. So, he decided to build it himself. Say hello to the Oculus Rift, the virtual reality headset that’s got the tech and gaming community abuzz. The Rift really took off after Luckey showed an early prototype to gaming legend John Carmack last year. Carmack liked it. A lot. He demoed a very early device for journalists—to great fanfare—offered to make Doom Rift-compatible, and featured the headset in his August QuakeCon keynote. Before getting to what it is, what isn’t the Rift? 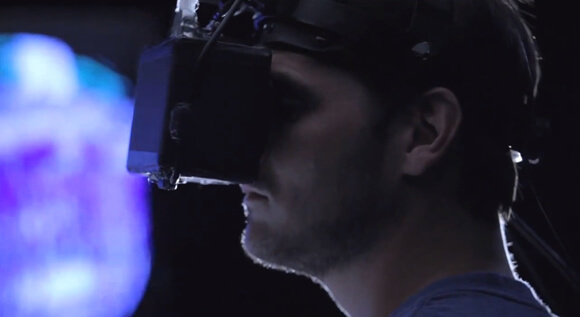 The Rift isn’t a consumer ready virtual reality headset. The Kickstarter is for developers. The idea is that by getting the tech out to the gaming community, Oculus can begin to build broad game compatibility while getting professional feedback on the hardware. How is the Rift different from prior attempts at head mounted VR? Instead of a 30- or 40-degree field of view (a screen with edges), the Rift offers a 110-degree field of view. There’s no discernible edge to the Rift’s curved 7”, 1280 x 800 display. The screen is split into 640 x 800 halves, lowering the resolution per eye, but allowing the world to be rendered stereoscopically—that is pairing two side-by-side images viewed from slightly different angles (parallax) to make things appear 3D. You’re fully immersed in the game-world. Resolution is a consistently noted drawback to the Rift. And it still only allows for head tracking, as opposed to full body position tracking. You can’t move your hand in the real world and see it in the virtual world. But neither is doomed to remain a major stumbling block. Compact displays are moving to higher resolution at lower price points. It’s hard not to want an Oculus Rift in your home, like right now. But there’s no word yet on the consumer version—only “we’re working tirelessly to make it available as soon as possible.” The firm has shipped 6,000 developer kits and aims to send the other 1,500 out by the end of May. The all-important developer phase will likely go through the end of the year. And well it should. Anticipation and expectations will be sky-high, and delivering that first, jaw dropping moment at home will be critical.